The Macworld | iWorld booth for Performance Designed Products was awash in iPhone and iPod touch paraphrenalia, many of the cases festooned with Muppets, Disney characters, and Marvel superheroes. And much of the attention seemed to be focused on PDP Mobile’s iPad Disney Cars Kid Kit, a $50 case-and-stand tied in to the popular Pixar movie that had largely been limited to sales at Disney’s theme parks prior to Macworld | iWorld. But me, I only had eyes for Nerf. That’s Nerf as in the Nerf Armor, an iPod touch case coated with the same spongy polyurethane material used in countless footballs, darts, and other unbreakable toys from my childhood. The Nerf Armor fits the fourth-generation iPod touch that Apple first released in 2010 and continues to sell now. 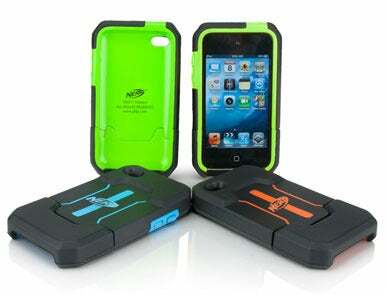 The Nerf Armor is a two-piece case that snaps into place around the iPod touch. Plastic tabs let you operate the volume and power buttons. Openings in the case let you access both the dock connector port and the rear-facing camera. There’s no protection for the iPod touch’s face, but a ridge around the front of the case keeps the screen from coming into direct contact with any surfaces, should you ever set your iPod touch facedown on a tabletop. Gripping the Nerf material that surrounds the back and sides of the Nerf Armor makes me feel like I’m holding my old Nerf football from back in the day. I just have to remember not to spike my iPod touch and break into a Billy “White Shoes” Johnson-style celebration the way I used to with the Nerf football. The Nerf Armor cases costs $35 and comes in blue, green, or orange colors.